WIndows computers and slacking on the security updates. ? Discussion in 'The Pub' started by Scrapperz, Apr 26, 2016. I've noticed with people who've slacked on updating their windows machines (laptops and desktops) and they ask me to help them fix something on their computer.....the first thing I do start updating. I'm talking about 6 months or more of no updates, lol. What I've noticed is that these so called abused computers seem to have one thing in common, they over heat. Some of them actually overheat and shut off many times before successfully updating. I don't seem to have this problem with mine. Any one have any experiences? Those who live on the cutting edge tend to bleed. I am a Mac guy so I can't speak to Windows issues, but I don't rush to update any software or the OS until I actually need some aspect of it, and definitely not until it's a proven stable release. I have no time or patience to deal with the inevitable issues that pop up when jumping on a just-released update. Still running OS X 10.9.5 here, as it works just fine and I don't need any of the newer versions at the moment. taez555 and Scrapperz like this. We're talking updates here. I'm postponing death as long as possible. Including the death of my computer. Scrapperz and Stratonator like this. I'm on a Windows 7 machine and haven't updated in months. Frankly, I got tired of microsoft trying to shove Windows 10 down my throat. If anything, my laptop actually runs better now. My browser blocks ads / scripts / flash and I don't click on links that I shouldn't. LOL, I like all the posts here. I'm not going to help people "kill" their "cornputer" anymore. They can do it themselves. AAhhhhhhhh, I feel so freeeee now, lol. Most folks dread computer problems. Updates are a well-known source of problems. fareye and Scrapperz like this. Has anyone suggested getting a Mac yet? MrLahey and Scrapperz like this. once i get a machine doing what i want, i tend to leave it alone til i'm forced to do otherwise. this is particularly important with "audio" machines that are built to make/capture/mix sound. on these machines running the latest & greatest M$ patch or version of Farmville usually isn't really going to improve performance. Havent updated since I bought this laptop, over 3 years I think. Tried to up date once and the whole thing slowed down. Removed it. Why do I have the feeling that most of the updates are for them to know you better than to help you use your device? I can't understand why so many people around me have computers with a life span of about 3 years before they start having "kiss of death" issues. most "over the counter" computers are under powered. any time a friend or relative has PC issues I start by admiring their polluted desktop & systray. then i move to the hardware. 9/10 there's an upgraded video card, a bunch of crap hanging off USB ports, Network/Firewire/SCSI/ECT - PCI/e cards, all powered by the factory 220w power supply that was barely enough to power the box when they got it. add all the bloatware that floods in from M$ & the internet, combined with users who lack the technical aptitude to do routine maintenance & you've got an endless supply of consumers ready to buy a new machine every few years. Yep, hahahaa. It's weird though, the ones with mac's seem to need windows. More than few times. They couldn't do work related "important" things without windows. Don't ask me why. They said they couldn't use just any browser and that it required explorer. Some web based applications were specifically written to use Explorer's instruction set and can't work without it. They overheat because nobody but IT geeks actually opens up their towers and dusts out their machine, or cleans a heatsink and reapplies thermal paste. gdomeier, Madsen and Scrapperz like this. Yeah, I blast the laptop every couple months with nitrogen and usually a bit of dust will blow thru. My plasma and ps3 are disgusting. 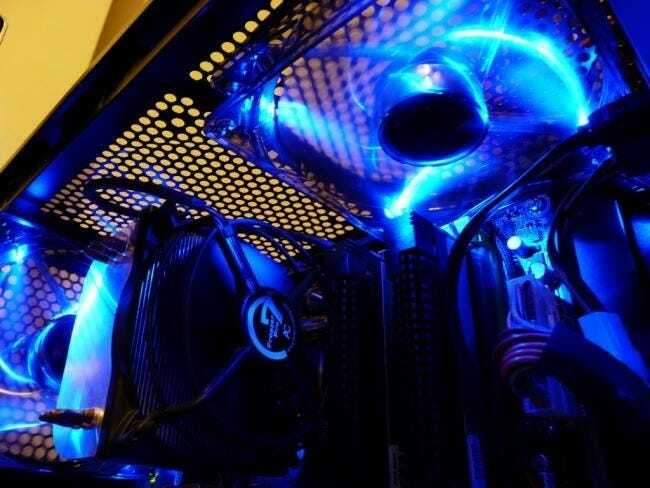 or throws in those nice colored glowing fans that make the case look like Tron. Was it ever determined that these machines no longer overheated after said updates? Internal cleaning, mechanical hard drive condition, file management and maintenance defragmentation, state & type of installed programs / databases, and potential malware, and finally, age of the system, all could be factors. I have T series Lenovos from the early to the mid- 2010's. T500, T510, and T520. I stopped buying them after they changed to an island type keyboard. These are rugged, solidly built business machines made for wear and tear. None of mine show that though. All of these machines I bought off-lease and refurbed I think spent their whole lives in a padded computer case and rarely saw the light of day. They were like new when I bought each of them. Only the T500 had an COA for Vista Business. Also had no hard drive, which are easily found on e-Bay with the Windows 7 Pro 64 OS. All three of these systems run Windows 7 Pro 64 and at least 8 GB of ram. The T520 has 16 GB of ram and is enough to run any current music software and most video software too. This is a six year old machine with an i7 processor and 500GB SSD and 500 GB spinner drive running Linux Mint. These are some of the best business machines ever made. My current machines were built in March of 2011. No issues whatsoever from the system board, CPU or RAM. One machine is running Win10 and the other Ubuntu Linux. I upgraded the main drives to SSds last year. I'm not a gamer so I save some cash and I'm running AMD CPUs. I have no issues at all. The only thing I'm missing is USB 3. I let Windows and Ubuntu update normally. Never had an issue. I used to upgrade every 2 years or so. I had to have the latest and fastest hardware. I outgrew that phase though. I do enjoy putting a machine together though. This is a batch file you can run from a Command Prompt that will take care of all of that too.